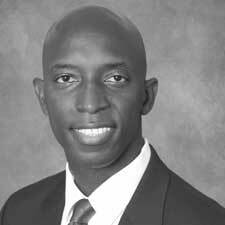 Mayor Wayne Messam has lived in Miramar for more than 15 years. A first-generation American, Wayne was the first of his parents’ children born in the United States. He was raised in South Bay, Florida by loving and hard-working Jamaican parents. His father, Hubert Messam, labored in the sugar cane fields of the Glades as a migrant contract worker for nearly two decades after immigrating to the United States with his family. Growing up in the Glades, Wayne learned the values of hard work, discipline and the pride of culture, community and heritage. Miramar’s cultural diversity and sense of community attracted Wayne to the City of Miramar to raise his own family. Wayne and his wife of 18 years, Angela, have three children: Wayne II (age 18) and twin daughters Kayla and Kyla (age 16). All of Wayne’s children attend public schools in Miramar. Mayor Messam is no stranger to leadership and success. As senior class president at Glades Central High School, Wayne was offered full athletic and academic scholarships to attend Florida State University. He excelled both on and off the football field. His accomplishments include being a starting wide receiver and a member of the 1993 National Championship Football Team under legendary coach Bobby Bowden. Mayor Messam was elected to student body vice-president by his peers during his senior year. One of his greatest highlights was when the FSU Black Alumni Association named him Student of the Year in 1996 for his exceptional accomplishments as a student-athlete. He graduated from Florida State University with a bachelor’s degree in management information systems in 1997. Licensed as a general contractor and a LEED-accredited professional, Mayor Messam is a prominent young professional in the construction industry. His company, Asset Builders, is currently building and managing some of the most exciting green-construction projects in America, including Galaxy Elementary. Mayor Messam has always had a commitment to public service; he was elected to the City of Miramar Commission in March of 2011. He currently serves on the National League of Cities’ Energy, Environment & Natural Resources Steering Committee. He served two terms as chair of the Broward County Small Business Development Advisory Board where he was very influential in the policy recommendations that affect the local and small business programs for Broward County and Disadvantaged Business Enterprise (DBE) firms. He also served as past vice-chair of the City of Miramar’s Planning and Zoning Board. Other community activities include his service as an Optimist football coach and vice-chair of the board of trustees for his church, The Fountain of New Life. He is also a member of the School Advisory Council (SAC) at his daughters’ school, Sunset Lakes Elementary.